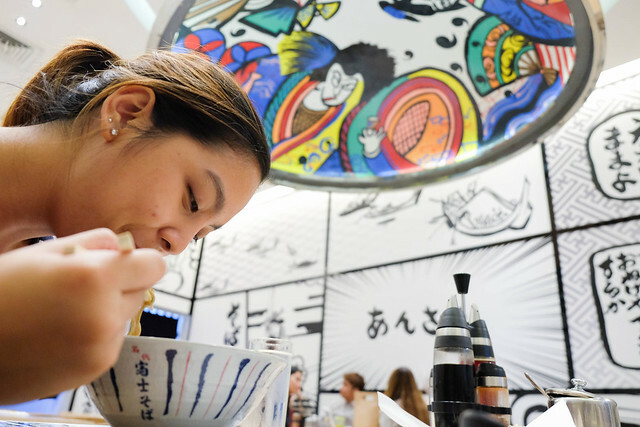 In case you’ve been living under a rock, the Ramen takeover is in full effect in the heart of the metro. 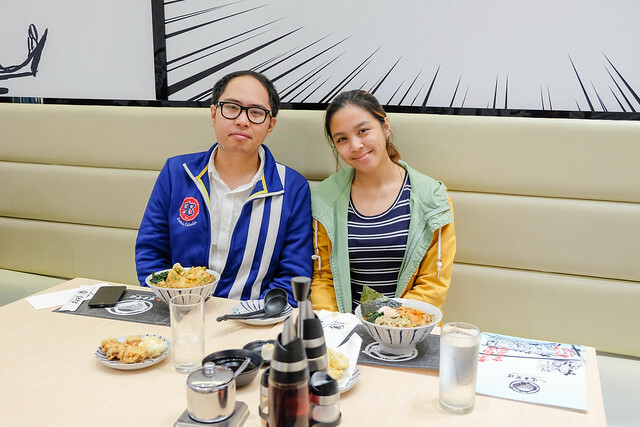 Despite the naturally hot climate of the Philippines, Filipinos still choose to fill out ramen stops at every available instance, proving that the love of food and the Japanese culture embedded in the Filipino culture is indisputable. 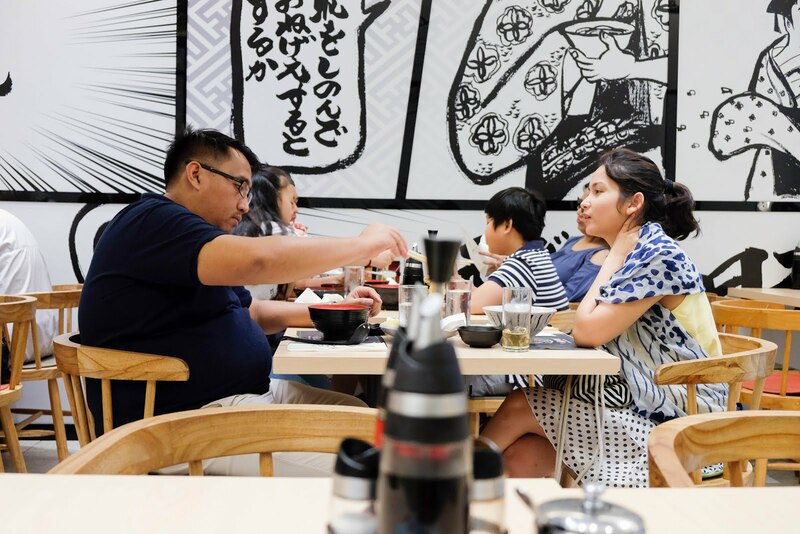 Ramen shops open left and right, but it takes a specific flair for one to stand out, like the right combination of food, service, and atmosphere. One such ramen store that hits all the right spots is Nadai Fujisoba, one of the newest to hit the metro. Their claim of “Best food at a reasonable price” definitely appeals heavily to the working class Filipino, but how exactly does it measure up to the common Filipino? Nadai Fujisoba were kind enough to invite us to try their store’s best, so let’s find out how it performs! 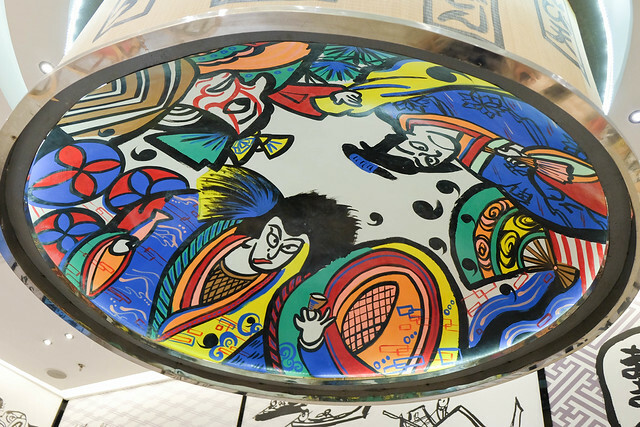 The Japanese characters and art on the glass wall outside entice a double take when you’re just passing by. Yes, it’s eye catching! It makes you want to tap your companion and say, “Yo, let’s eat there sometime.” whenever you pass by. 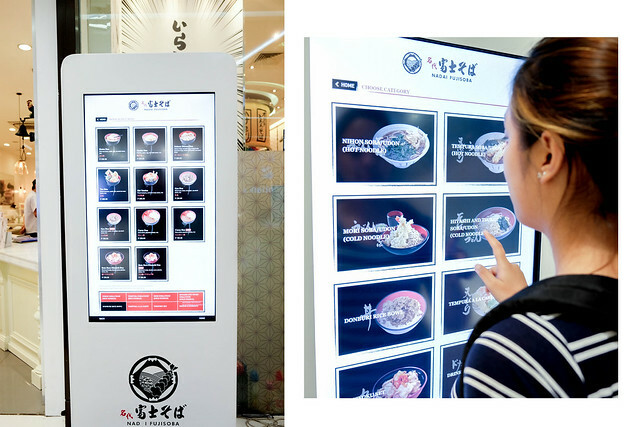 There’s also a giant touch screen outside that acts as your menu while you’re waiting to be seated, or just curious about the food whenever you pass by. A definite plus from the standard cardboard/clear book menus we’re all used to. In fact, I had a little too much fun playing around with the menu. There is also a plethora of ramen seemingly frozen in time as a display piece. 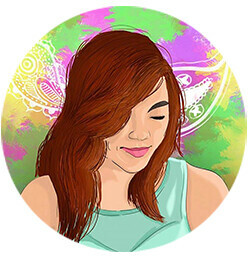 Overall, it looks very minimalist, what you need is there, no nonsense and in your face of what you're getting. More of the same japanese art on the walls, but cranked all the way up to 11. 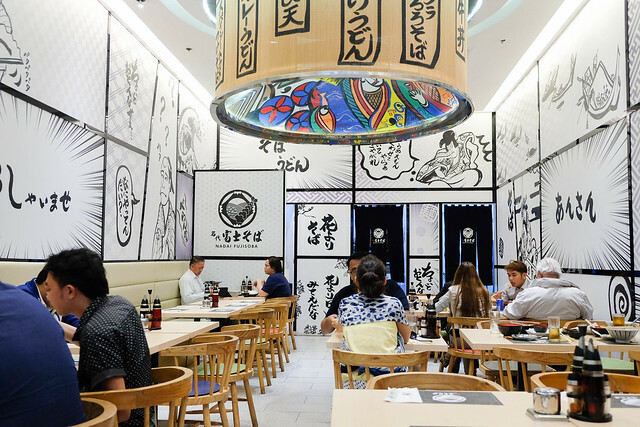 The quirky manga-esque panels across the walls give the place a contemporary look, but the Japanese calligraphy blended with it reminds us of the classic, deep seeded Japanese culture that we’re all familiar with. The standout piece is at the center of the store, the giant thingamablob (aka the centerpiece on the ceiling) with all the classic Japanese art. It’s the first thing you see, and the one thing you’ll fix your gaze on for about 80% of the time you’re not looking at the gorgeous looking food in front of you. We ordered the Yasai Kakiage Ten Udon (a ramen with mixed vegetables, onion leeks, wakame seaweed and a vegetable tempura in the center) and the Aka Fuji Soba (a ramen with sliced beef, red miso paste with chili, half-boiled egg, onion leeks and wakame seaweed). For the sides, we ordered a Nag Kisu Ten (Fish Tempura) and a Karaage, and for dessert, we went with the Sobacha Pudding. 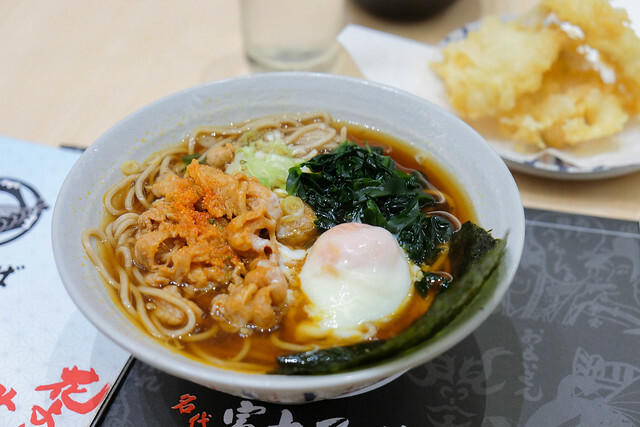 For the ramen in the menu, you’re given the option to order it with the Udon or Soba noodles. Soba noodles are the more standard thin noodles that we are all accustomed to, while the buckwheat noodles have a thick, rough texture that makes it kind of feel more filling. The Udon noodles are thick, smooth noodles that I found isn’t as common as Soba. It feels more heavy and filling compared to Soba, so if you’re looking something different, I recommend the Udon. 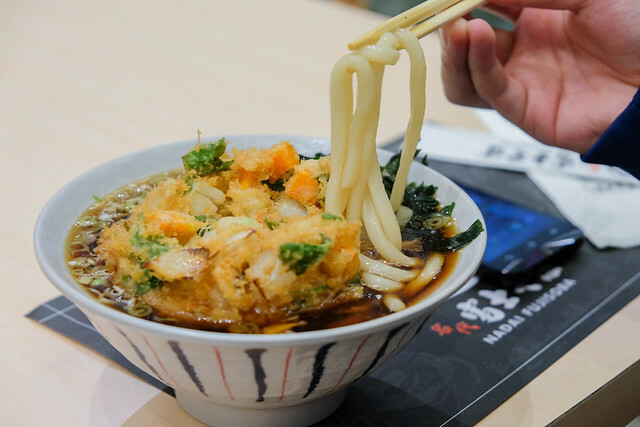 The Yasai Kakiage Ten Udon is basically a ramen that has a vegetable tempura in it. At first, I thought that this is a bad combination because I thought the tempura would get soggy. (It was floating around in the ramen broth!) Few slurps later, I found out that letting the tempura soak in the broth is one of my favorite Japanese food hacks. 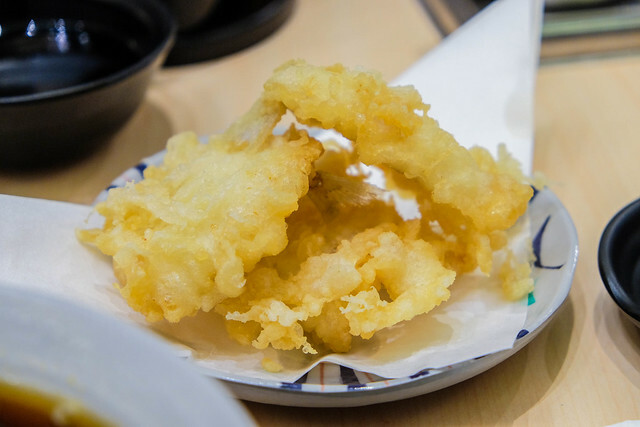 Not only did the tempura has its own unique, solid flavor, but it also absorbs the flavor of the broth, extending the flavor of vegetable tempura to a whole new flavor. The broth was decent, it’s what you’ve come to expect from these ramen stores, although I found that the flavor of the broth depends on the meat you order. The vegetable tempura gave the Yasai Kakiage Ten Udon a sweet taste. For the sides, we ordered the Nag Kisu Ten, which is basically a Fish Tempura. It was nice and crunchy on the outside, and feathery on the inside. It had a lightly salted flavor that was perfect for the what it was. The Karaage was nice and juicy. 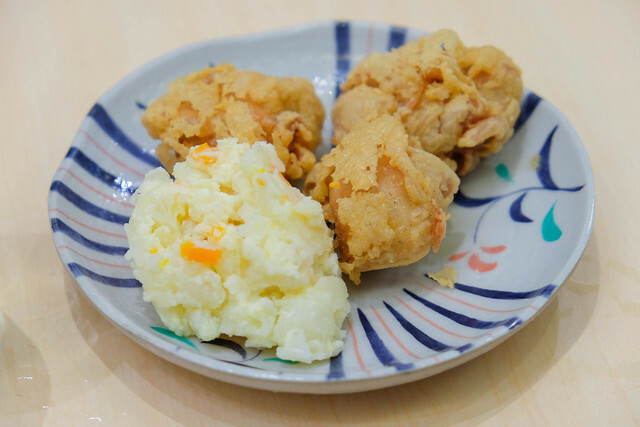 What can we say about a good Karaage other than it makes you want more, right? Order one for yourself if you don’t feel like sharing, it will be worth it. For dessert, we had the Sobacha Pudding. 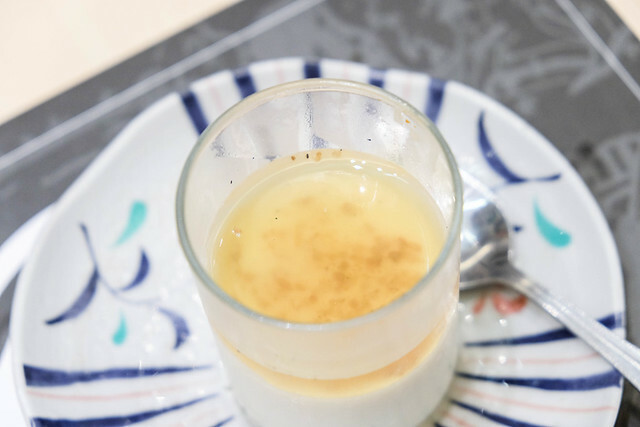 It’s a gelatin in a small glass with roasted buckwheat seeds. It tasted very mild with the gelatin having a bland taste. Regardless, the real flavor comes from the roasted buckwheat seeds which taste is heavily influenced by the dried coconut flakes. (Think biko, the sweet rice cake with shreds of coconut flakes on top) This light, sweet tasting gelatin was the perfect way to end what was a great dinner. 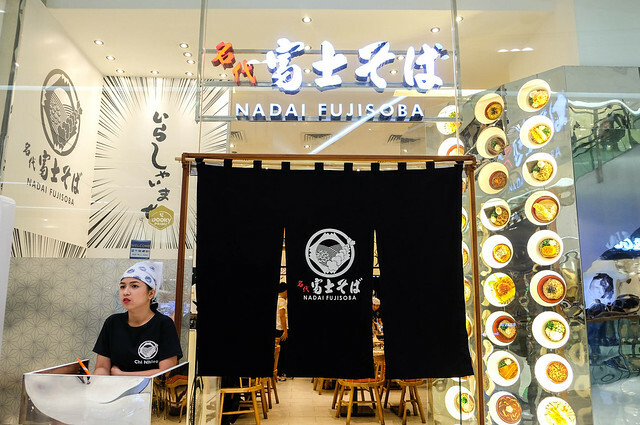 Give Nadai Fujisoba a visit in their following branches: SM Aura Premier, Bonifacio High Street, SM Mall of Asia, The Block at SM City North Edsa, and SM Megamall. You can also check out their menu at fujisoba.ph.